Meet Samra Kesinovic and Sabina Selimovic, Bosnian (Balkan) refugees living in Austria. Both gals – girls I’d have loved to have met while I was in high school, were raised by their secular Muslim parents. They have been described as ‘Viennese beauties’ who ‘enjoyed singing, writing ‘and as Samra’s uncle Amir told us, learning about…..the Koran. Yes, in spite of their appearance here, BOTH were raised Islamic, in a mixed community. So how did they become radicalised? 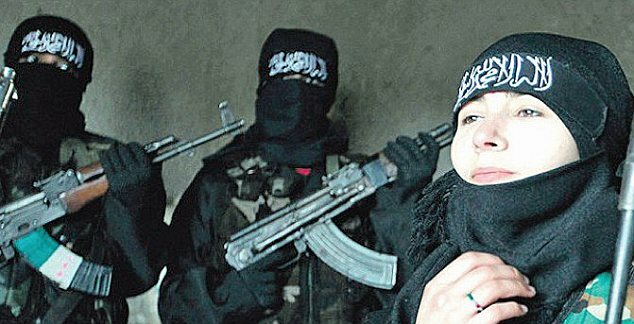 Apparently their Islamic boyfriends tricked them into joining the Jihad in Syria. When asked if Samra adhered to the strict tenets of Islam, Amir said, he “believed so”. When asked if he felt that attacking the Assad government was right – something his niece was in fact tricked into doing, he also responded in the affirmative. In our estimation their involvement with local radicals was made possible by their involvement in the local Islamic community, which operates outside of the law and under the protection of our Marxist oppressors. These girls were brainwashed since birth, and NOT by any con men lurking in the shadows of the local mosque, as Samra’s uncle believes. So how can this happen in Austria? Because liberal Austrian society permits it. Our Marxist oppressors have facilitated the perfect environment for Islamism to take root o European soil. Islamism is a threat to ALL it encounters, and needs to be stoppped. I say this as I expect to read comments claiming that Islam isn’t the problem it’s the JOOS! Islam, as this article demonstrates is on its way to imposing its will and Sharia Law upon our lands. 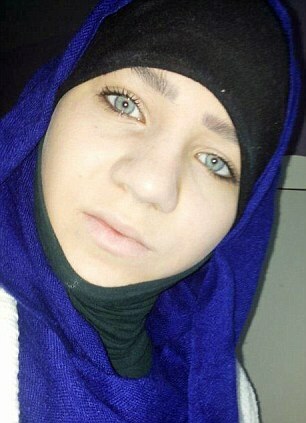 Samra and Sabina lived Sharia in Christian European Austria, and THAT is why they are now in the mess they’re in. Any nationalist that thinks otherwise is misguided at best, a traitor at worst. There will also be cretins that read this article that will argue that these beautiful girls aren’t really European due to the fact that Bosnians/people from the Balkans, have Turkish ancestry, but LOOK at their photos for PROOF that these BEAUTIFUL girls are European. I’m half Calabrese and can tell you that you’ll be hard pressed to find girls living south of the mezzogiorno – in Portugal, Greece or Spain, that look half as white as these blue-eyed lasses. It’s Islam mixed with non-Western Balkan mentality and W. European liberalism – not genes. These people are ATTACKING innocent middle eastern civilians-the Kurds, Yezidi, Syrian Christians, and not the occupying US, Israel – the people that are in fact arming them. ISIS was created as a false flag operation designed to incite us into a hatred so intense, it would result in the empowerment of the ‘only democratic state in the middle east’, and give the Americans a free pass to do as they pleased in the Middle East. Samra and Sabina are pawns. They have been sent to Syria for the precise reason they were brought to Europe in the first place – to destroy. So what have Samra and Sabina been up to since last we profiled them? Killing INNOCENT Christian and Muslim civilians . For updates on Samra and Sabina’s misadventures in Syria, where they’re currently bring passed around a desert campfire like a hookah after a goat tagine please subscribe to our newsletter at the top of the page. 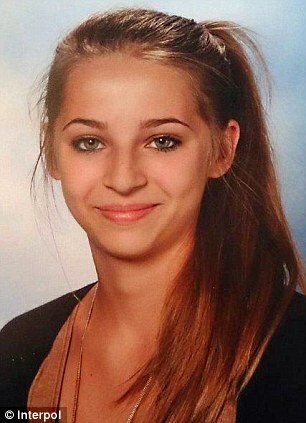 Interpol is now searching for two Austrian teenage girls who they claim were tricked into going to Syria to fight for Islamist rebels. The girls vanished from their homes in Vienna on April 10. But the parents say that they don’t believe the messages are being written by the girls. Authorities suspect they have been tricked into leaving the country. Samra and Sabina come from Bosnian refugee families who settled in Austria after the ethnic wars of the 1990s, and were born in the country. New photos on their Facebook pages show them brandishing Kalashnikov rifles – and in some cases surrounded by armed men. However, it has since emerged that some of these pictures have been circulated online for years – casting doubt on whether they actually show the girls. 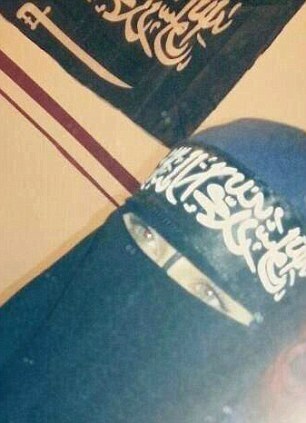 In the latest posting they announced plans to marry so that they could become ‘holy warriors’ and in the messages they say: ‘Death is our goal’. Their families doubt that the messages were really written by them. Austrian officials believe that the pair, judging by the scenes around them, are in a training camp and are not only already married, but also already living in the homes of their new husbands. It is thought that they have been sending online messages to their friends speaking of their new lives and boasting that ‘nobody will ever find us’. 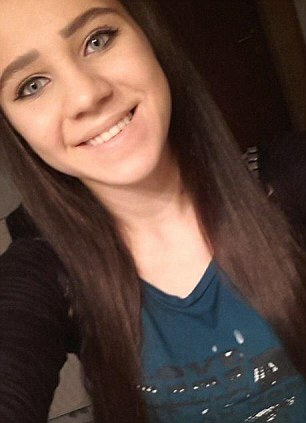 Austrian media said the two teenagers had become the public face for the call to jihad in Syria, and alleged that they had been tricked into going to the country in order to publicise the call to arms. The latest case of young people getting caught up in the Syrian conflict comes after an 18-year-old British man died in Syria – only for his father to reveal he had no idea his son had gone there. Abdullah was the nephew of former Guantanamo Bay detainee Omar Deghayes. And this is what theyre respeonsible for. 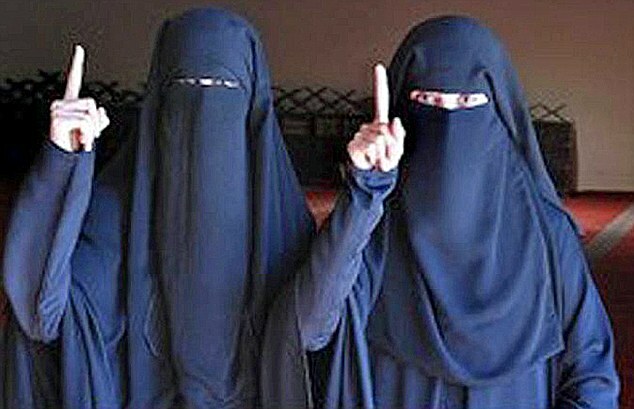 Interpol believe the girls have been taken to Syria. 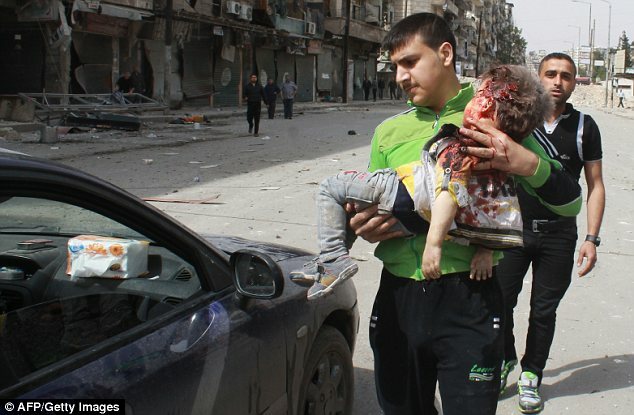 Pictured is a man carrying a wounded child after a bombing today in Aleppo, northern Syria. Update – Oct 13, 2014 It appears they want to go home!